We receive emails on a regular basis asking for more information about our product, The King’s Oil. 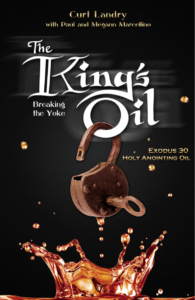 Recently we decided to offer a copy of The King’s Oil: Breaking the Yoke booklet. The King’s Oil: Breaking the Yoke is a 51-page booklet that you can read in order to gain a wealth of biblical insight. We are proud to make it available to further the restoration of the Church and to show Believers how to use this spiritual tool to break the yoke and serve God as a Kingdom of Priests! If you would like to learn more about The King’s Oil, we encourage you to check out this excellent resource, by joining us at our website [HERE].